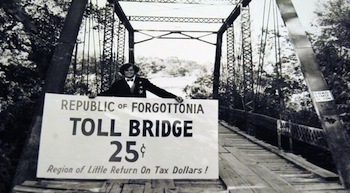 This is the Forgottonia Publicity Photo, pictured is Neal Gamm, the Governor of Forgottonia. Read a farewell to Neal Gamm by Terry Bibo Gone but not Forgottonia. Forgottonia a concept to protest the lack of attention Western Illinois received from state and federal governments. The name Forgottonia captures an image of a region off the beaten path, which is very true of Western Illinois. I	am	guessing	the	bridge	spanned	Crooked Creek (LaMoine River); there were many such bridges in use at the time, circa 1972. Adams (Quincy), Brown (Mt. Sterling), Calhoun (Hardin), Cass (Beardstown), Fulton (Lewistown), Hancock (Carthage), Henderson (Oquawka), Knox (Galesburg), McDonough (Macomb), Morgan (Jacksonville), Pike (Pittsfield), Schuyler (Rushville), Scott (Winchester), and Warren (Monmouth). I am just starting this project, I will be inviting others so hopefully new settlers will be setting up camp. Some will put down roots and help grow the community. Copyright (c) 2013 Forgottonia.org. All rights reserved. Design by FCT. Background photo by fotogrph.